When I sat down on Monday to finish designing projects for my camps and classes this week, it hit me that summer is almost over! Wow, it sure has flown by and has been filled with some truly wonderful moments. I've spent time with friends both near and far, had an exhilarating and wonderfully surprising experience at our Stampin' Up! convention, spent a wonderful week with my family at the beach and enjoyed lots of fun stamping time too! I started the Summer Mini Catalog season off with two full packs of this gorgeous Island Oasis Designer Paper and when I pulled it out to make this card, I discovered that I'd used almost all of it! How this beautiful flower design escaped cutting until now is a mystery to me! But, I was glad, because I LOVE how this card turned out and so have all the stampers who have been here this week! The entire card is created with the Big Shot with the exception of the greeting which is punched out with the Modern Label Punch. I made the card base by cutting a piece of Pumpkin Pie cardstock at 4 3/4" x 9 1/5". It's folded in half and then laid on the Scalloped Circle die with it covering all but 4 scallops. This allows the Big Shot to cut a folded, shaped card. I did use my White Gel Pen to mark the scallops for perfect placement. 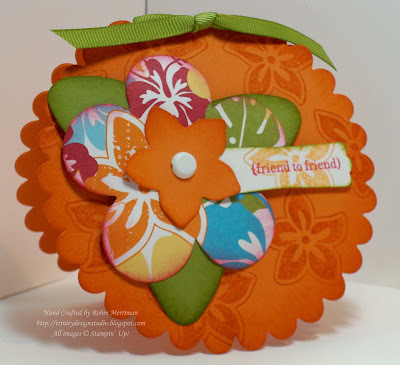 Once I had cut the card, I randomly stamped the large flower image from the Tropical Party stamp set in Pumpkin Pie ink. The edges were sponged as well. To make the flower, I used the Big Shot Island Floral Bigz Die from the Summer Mini and cut all three pieces at one time by layering them on the die. I put down the Island Oasis paper first, then the Pumpkin Pie flower center, then the leaves. I love that you can do this with the Big Shot - it saves so much time! Once the pieces were cut, I used my Bone Folder to curl the edges and then sponged ink on each piece - tone on tone for the Old Olive and Pumpkin Pie, Rose Red on the floral dsp. The best thing about using this die is that it punches the center hole for you! So all I had to do was stack my flower and add one of the 5/8" Brads to the center. So easy! The whole flower was attached to the card front with Stampin' Dimensionals and my greeting was added with a dimensional as well. I used Teeny Tiny Wishes for that and it worked wonderfully for my classes as everyone used the greeting they needed for their card. So, take a last glance or two through your Summer Mini catalogs or check out the offerings on my Stampin' Up! website. There are some real treasures in there that are retiring next Tuesday, 8/31 and I don't want you to miss them. Want to know my favorites besides what I used today? Well, Favorite Thoughts - the set of 'women's' quotes is awesome and you only need one clear block (H) for the whole set so it's a bargain at just $11.95 for the clear mount! Blissful Bride is such a sweet bridal stamp set, I used it for two swaps and several cards and just love the simplicity of the images. It would work well for all occasion cards too with the cute cake and flower images. That one too is a steal at just $16.95 for the clear mount. Sweet Scoops was a fabulous set for making fun birthday and kids cards. I can't tell you the number of swaps I received with this set and the samples I've seen with it. It was one of the most popular sets from the book and with good reason. And again, a great price at just $14.95 for the clear mount. Everyone needs a set like this in their stamping tool box! Lastly, there are two Satin Ribbons that are NOT carrying over into the new Idea Book and Catalog - Chocolate Chip and Basic Gray! In fact, neither of these colors are in ANY of the new ribbons, so if you want Chocolate Chip ribbon, at least this year, this is your shot so don't miss out on stocking up on a couple of rolls. Both of these are just $8.95 for 15 yards on a roll - that's a deal! Have a wonderful stampin' day! Great card Robin!! I love using the scallop shape to jazz up the card from just a rectangle! I too will miss summer..fall is coming to early for us up here in cold land...Edmonton, Alberta! Stamper's Block - A Tale of Woe! Sneak Peek - Christmas Collage! Coming Soon - Paper and Ribbon Shares! Two Days in Paris - If Only! UDI Inspiration Challenge - I'm Baaack!!! Convention Fun - Part 1!